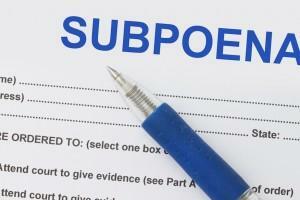 You’ve just been served with a subpoena, what does that mean? Being served with a subpoena isn’t the same as being served with a lawsuit, so first just relax. A subpoena is a formal writ ordering a person to appear in front of a court. This is often to testify as a witness in a case. There are two types of subpoenas. A subpoena ad testificandum compels a person to attend and give testimony at a certain time and place as specified in the subpoena. A subpoena duces tecum requires a person to produce certain documents designated in the subpoena and may require appearing and giving testimony as well. If production of records is sought, certain text required under the rule must be included in the subpoena as well. A subpoena for testimony in a trial or hearing must be served no later than 48 hours before the time for appearance set out in the subpoena. A subpoena for deposition testimony must be served no later than 7 days before compliance is required, and a subpoena for production of documents must be served no later than 14 days before compliance is required. The subpoena must be personally served on a witness, that is, in person, not by mail or publication. If you are served with a subpoena requiring your testimony, you are required to show up to the court on the subpoena at the time stated, and remain until the court releases you. If you receive a subpoena requiring the production of records, then you are only required to produce those records or documents, you are not required to attend the court hearing. Receiving a subpoena is seen as an obligation that a citizen owes to the government, and should never be ignored. As part of your required attendance, you will be tendered payment of one day’s mileage at the time you are served or within a reasonable time after service. However, if the subpoena is issued by the state of Colorado payment of mileage need not be given. If you fail to obey the subpoena, the common method of enforcing a subpoena is to obtain a court order requiring the witness who was served to appear before the court, or by initiating a civil contempt proceeding. subjects a person to undue burden. This is not an exhaustive list, and there may be other reasons the court may deem to quash or modify a subpoena. As required, you should appear before the court, and if needed provide records, as long as you were properly served in the required time period. If there is a reason why you cannot testify or produce documents, you may need to seek the help of attorney who can file a motion to quash or modify. However, never ignore a subpoena as you may face a civil contempt proceeding.